Arione. 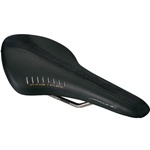 Maintaining the shape of first Arione saddle, with her quality and comfort reach the best performance level. Antares 00 is stiffer and lighter than Antares braided. Aliante Gamma. The choice of enthusiast riders. High performance carbon reinforced shell.